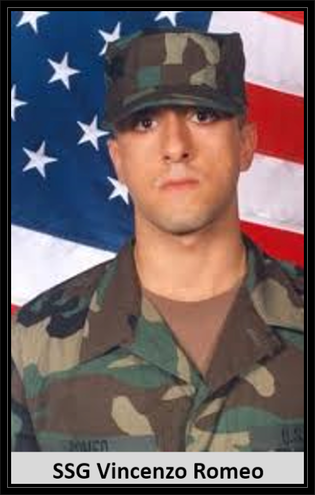 Hometown: Lodi, New Jersey, U.S.
Died: May 6, 2007 in Operation Iraqi Freedom. Unit: Army, 5th Battalion, 20th Infantry Regiment, 3rd Brigade, 2nd Infantry Division, Fort Lewis, WA. 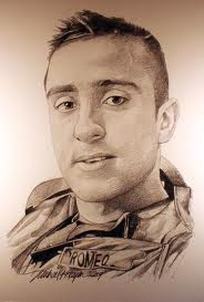 Staff Sergeant Vincenzo Romeo, 23, of Lodi, died May 6 in the Diyala province of Iraq. 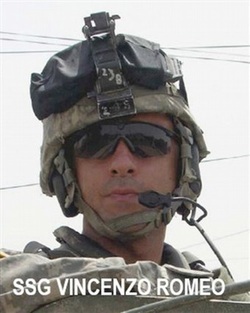 He was an assigned to Company A, 5th Battalion, 20th Infantry Regiment, 3rd Brigade, 2nd Infantry Division, also known as the Stryker Brigade Combat Team, in Fort Lewis, Wash.
Romeo, who was born in Calabria, Italy, came to the U.S. with his family in 1986. He graduated from Lodi High School in 2001 and attended Kean University for one year before he enlisted in the U.S. Army in March 2003. Romeo, who received numerous awards, including the National Defense Service Medal and the Global War on Terrorism Expeditionary Medal, was on his second deployment to Iraq. He is survived by his parents, Saverina and Antonio, two brothers, Bruno and Carmelo, and his fiancee, Amanda Anderson. Staff Sergeant Vincenzo Romeo had planned to marry his fiancé, Amanda Anderson of Tacoma, when he returned from Iraq later this year. This latest tour was Romeo’s second to Iraq, one that was extended by three months in an effort to bolster troop levels in the country. Staff Sgt. Vincenzo Romeo, right, with his mom Saveria and cousin Vinny in April 2006.